is closed for the forseeable future. The winning Poem for the January competition was chosen by my daughter, Gemma, and is Poem number 2 "ANGELS, ANGELS, WHERE ART THOU? " by Kim McCaffery. Congratulations to Kim on winning your free Reading! Where knelt I to try to give him Human Love. And I felt Love MORE than I could ever seek! In bliss himself he gave unto me all! That night he traded his Love for my Pain! ANGELS, ANGELS, WHERE ART THOU? You walk amongst us at all times. At times loudly - to get our attention. If only we would listen. How beautiful your light shines upon us. This is where you want to be. But most of all by Love. And now happiness is all you will gain. Your Love will Always be near. in her I can confide. The winning Poem for the September competition was again chosen by Tina Place, and is Poem number 3 "I have a Guardian Angel" by Lisa Owens. Congratulations to Lisa on winning your free Reading! Lingering with songs of long-ago. and guides me when I face a dead end. I don't have to wear make-up or try to stand apart. But I always get reassurance of warmth on my skin or a feather to see. Or go into a deep crying spell. I realize that as a human we go through lessons and have free will to train. Nor does it criticize the way I dress. I can invoke it more by smiling and when I pray. Strip me of bare of everything that i am and then send me to Earth. All I feel it is like, im too sensitive for this world, how do i cope without knowing, who i am? Then i hear, sweet voice of My Guardian Angel "Patrick, your time is close"
Could this be true, what im seeing? Too scared to say it outloud. In human form, to do God's will. Little did i know, my work already had started. to SET YOU FREE from FEAR and give you tool of FREEDOM! I gift you this GIFT, straight from Hands of YOUR Guardian Angel. which with lead to your Angel. With love in fantastic blade's of Angelic LIGHT! As i sit and wonder why ? it's clear to see "It is assured "
"We will not part "
The bond we share . so we will never be apart. so that our love, will stay strong. like a sheild of protection from those who are not true. We are there light and they are there to help. And most of all bring me love. the end of my time in this world. and is Poem number 13 "Angels" by "Anon H". Congratulations to "H" on winning your free Reading! I wonder what is the point, who will miss me? Is it my passed family? "Do not despair, we are here holding you up"
whether it be near or afar. for everything that you do. Then ever so gently down i come..
Back to were i'd started from..
they cross with us many paths they are waiting to respond us back. Is it because of me? Wherever they may take you. I am a free Spirit. to speak up and speak out for my self. No one is quite like Me . Nor I like anyone else . There is no need for me to even try . fear is a reminder of times gone past. So remember who u are , One Mind , One Body , One Soul. My journey in life is to bring Me back to Myself , My Soul. I am a free Spirit . to speak up and speak out for my self . Could this rough path be safely trod? My Guardian Angel where are you ? I can only say "Thank you"
That have been there from my start. And walks by my side anytime I use my feet. unlike humans, their species is gender free. When the eyes of death stared in my face. Was the annunciation of his presence. This land they placed me in. One more go around in the rat race. The future was looking pretty grim. And I realized I had been asleep in sin. As night-time fell shadows came my way. I have no doubt HE is coming soon. No longer shall HE see loved ones scorned. spirit awakening, my imagination, euphoria, paradise, unity, harmony, stillness, and me. And whom do I honor for these feelings of divine enlightenment, the angelic angels, and my spirit. Who guide and travel with me. They come to me in my thoughts intuitively. Celestial message...s that ground me, angel’s sweet divine angels. 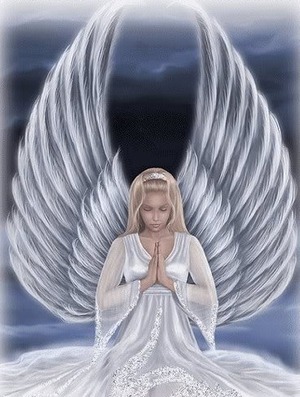 "All Angel Poems & Quotes featured on this page will have been certified as true and original by the submitting author who will also have given their permission for their work to be featured on this site."